IT managers and facility managers make promises to their businesses and their customers to maintain critical system availability. One key way they can keep their word and deliver on those promises is by properly monitoring and maintaining the batteries that back up the UPS. After all, a UPS is only as reliable as the batteries that support it, and all too often, battery failure is the cause of unplanned, costly downtime in data centers. Monitoring alone may not be enough. Maintaining and continuously monitoring critical battery parameters to detect early signs of battery degradation can go a long way toward reducing battery failure and thus preventing downtime. However, evidence suggests that stationary battery monitoring and data collection might not be enough. In our 2007 white paper, “The Effect of Regular, Skilled Preventive Maintenance and Remote Monitoring on Critical Power System Reliability,” Emerson Network Power demonstrated that while data centers with on-site battery monitoring systems had a reduced rate of outages due to bad batteries, outages did still happen. Such outages occur when customers do not properly monitor the system, or when they do not know how to properly analyze the data provided by the monitor. Simply put, having the right information, and knowing what to do with it, are two very different things. Remote monitoring ensures added protection. Monitoring that enables remote services is a solution to address these issues. Remote services allow a third party service partner—preferably a partner with full knowledge of critical infrastructure and battery maintenance best practices—to monitor data collected by battery monitoring technology and properly maintain the system based on the data analysis. The latest technologies, as seen with Albér battery monitoring solutions, monitor parameters such as cell voltage, overall string voltage, current, and temperature. The technology also enables automatic periodic tests of the battery’s internal resistance. Such monitoring and testing verifies the operating integrity of the battery and identifies potential problems early on. When this technology is supplemented with remote services, skilled battery experts support battery monitoring efforts around the clock. 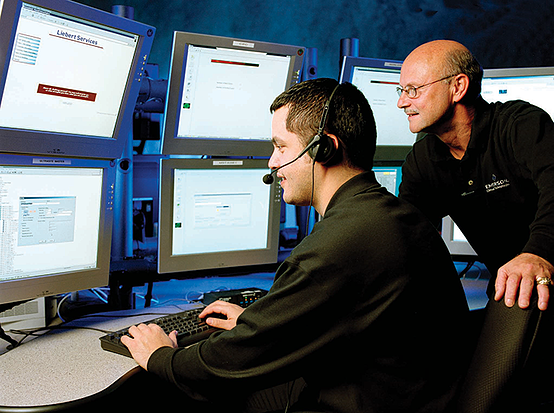 When the monitoring technology detects issues, the remote service technicians receive alerts. They can then put into action a pre-defined escalation plan to address the alarm. As a result, the appropriate steps are taken to correct minor battery problems before they evolve into major system issues, thus protecting other batteries in the string, preventing major system damage, and improving overall system availability. As an added benefit, remote service providers can analyze the comprehensive data collected by a battery monitoring system and provide data center managers with essential information for making battery maintenance and replacement decisions. Outside help can improve performance within. A battery monitoring solution that enables remote services allows data center managers to augment their staffs with around-the-clock, expert support for maintaining battery health and preventing costly downtime. This allows IT and facility staff to focus on more strategic data center infrastructure management initiatives that support core business objectives. Ultimately, battery monitoring with remote services allows IT and facility managers to do their jobs more effectively, dramatically reduce downtime risks, and ensure system availability for the businesses and the customers they serve.